If you are a breakfast person, or someone who enjoys a lot of hamburgers, bacon and sausage, then owning a stainless steel electric griddle may be something you have been wanting to do for a while. Stainless steel electric griddles not only look great when sitting on your kitchen counter, but griddles are great for making enough pancakes for the entire family, or a complete breakfast of bacon, eggs, and hash browns all at the same time. Now part of the Sunbeam products company, the Oster Company was founded in 1924 by John Oster. It quickly became a manufacturer of small household appliances, and the Oster brand is associated with such kitchen appliances as blenders, toaster ovens, bread makers, and mixers. The Oster ECO-DuraCeramic Reversible Grill And Griddle is just one the many products this company produces. This is a great kitchen appliance for anyone who loves grilled food all year round, or who likes to make breakfast for an entire family. This griddle/grill combination is perfect for those who are trying to lose weight, as it is easy to make healthy omelets and even fried eggs using low calorie cooking spray, and then grill rather than fry that chicken, seafood, or grilled vegetables for dinner. Reviews for this Oster Griddle/Grill Combination are extremely good, with most customers finding that this appliance meets their expectations and is extremely useful. Overall, most customers were really pleased with the Oster ECO-DuraCeramic Reversible Grill and Griddle, felt it met all of their needs and were very happy with their purchase. Waring Pro is a leading supplier of professional quality appliances such as the Waring Blender and this Commercial 120 Volt Electric Counter Top Griddle. 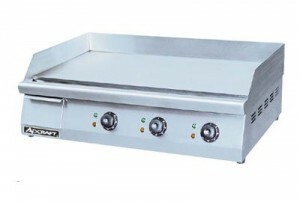 This Waring Commercial 120 Volt Electric Griddle is built much like the larger ones you will see in many restaurants. This griddle might work well in a food truck or in a large kitchen, where it could have its own permanent place right next to the stove. Anyone who has ever worked in the food service industry will have some idea of how many foods you could make on this appliance, often doing away with the need to use a kitchen range at all, (except for baking and casseroles). There are only a few scattered reviews around the internet for this griddle, no doubt due to the fact that this is a large griddle which will take up a lot of space on your counter top and will be difficult to store. All in all, customers who purchase the Waring Commercial Griddle we thrilled with their purchase and felt it more than met their expectations and needs. Cuisinart has become a popular name in kitchenware, as this company not only makes a range of small kitchen appliances, but it also makes a variety of bake and cookware products, as well as dinnerware. The Cuisinart GR-150 Griddler Deluxe Brushed Stainless Steel is just of the many products this company manufactures and distributes. It would be difficult not to be impressed with the Cuisinart Griddler the moment you see it. This griddle seems capable of doing almost everything, from making those oh so good Ooey-Gooey grilled cheese sandwiches, to grilling steaks, vegetables, and seafood, to making that golden fresh toast and those fluffy omelets! This stainless steel electric griddle just might make cooking fun for the whole family. There’s no doubt that the Cuisinart Deluxe Griddler was a big hit with customers, who were delighted with the functionality and the feature of this griddle. Admiral Craft (Adcraft for short) was established in 1952, and over the years has become a well known name for counter top kitchen appliances among those in the food service industry. This company offers over 2000 different products of which the Adcraft Grid-30 Commercial Flat Grill New Griddle is only one. The Adcraft Grid-30 Griddle is a large attractive griddle that may be too large for many smaller kitchens. However, its huge amount of cooking space does make it an attractive appliance for those larger families who like to all enjoy breakfast together, as this allows you to make huge amounts of pancakes, or several omelets all in one go. This may also be the prefect griddle for anyone who wants to start a food truck service, or have a beach side food shack. Unfortunately, due to the large size of this grill/griddle, finding customer reviews for this grill is difficult, if not impossible. There are a couple of small food services business people who have written reviews praising this griddle, on both its form and function. While griddles aren’t the most useful appliance for everyone, they can be wonderfully useful for larger families, allowing them to share time over a leisurely Saturday breakfast, enjoyed as a family. Imagine being a family of 4, 5 , 6 or more, and being able to gather around the breakfast table and all enjoy those hot pancakes straight from the grill all together, instead of waiting your turn until those one or two pancakes are done. By the time the last hungry family member gets their pancakes or omelet, the first members of the family have finished their meal. Now with an electric griddle, you can all eat together, which most families love to do.